Bronkhorstspruit, South Africa -- The Nan Wua Temple, located near the little village of Bronkhorstspruit in the Gauteng Province of South Africa, is the largest Buddhist temple anywhere in the Southern Hemisphere. In 1992, the apartheid system in South Africa was on the verge of collapse. Nelson Mandela had been freed from Robben Island Prison two years earlier, the African National Congress was un-banned and had organized itself as a political party, and the 1994 elections that would bring the ANC to power were just a few years away. During this time, a city council member in the tiny farming village of Bronkhorstspruit, about 30 miles east of Pretoria, made an unusual motion. 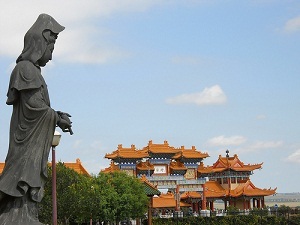 Dr Hennie Senekal, a South African minister, had visited Taiwan a year earlier as part of an effort to attract international businesses to invest in Bronkhorstspruit, and had been attracted to the Fo Guang Shan order, a branch of monastic Buddhism that followed the "Pure Land" school. Senekal and Venerable Master Hsing Yun began talking about the possibility of opening up a Buddhist center in South Africa. On Dr Senekal's motion, the Bonkhorstspruit City Council donated six hectares (about 15 acres) of land to the Fo Guang Shan order, and invited them to build a monastery and outreach buildings there. Later an additional eight hectares were donated. Construction began in October 1992, and first the Temple, then a seminary, assembly hall and a Ch'an (Zen) meditation retreat were finished. About 95% of all the construction materials came from local South African sources, and the project provided South Africa with a large number of much-needed jobs. In all, the complex cost about 60 million Rand (about $6 million), a huge boost to the surrounding economy at a time when unemployment amongst Black South Africans was over 50%. The financing came from the Order's headquarters in Taiwan as well as from the large Taiwanese community in South Africa. Venerable Master Hui Li came from Taiwan as Abbot of the new monastery. "1. 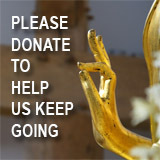 Propagate Dharma: Teach the methods of the Buddha so that people my leave suffering behind and gain joy, to bring true joy to the sentient beings of Africa. 5. 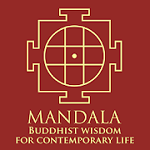 Construct temples: To construct temples for laity and monastics to live in and practice Buddhism and give sentient beings a place for learning and practicing the Dharma." Today the Temple complex welcomes visitors of all faiths, and has become an important tourist attraction for Bronkhorstspruit.